The Whakatāne Museum houses over 800,000 in its collections. Our Taonga Māori collection includes significant examples from Ngāti Awa, Ngāi Tūhoe, Ngāti Tuwharetoa, Ngāti Rangitīhī and Te Whakatohea as well as the Te Kōhika collection comprising examples from one of the most important swamp excavations in New Zealand. The Museum display and exhibitions are located at Te Koputu a te Whanga a Toi, Kakahoroa Drive, Whakatāne. 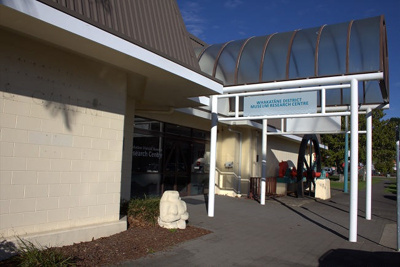 The Whakatāne Museum holds an extensive collection of archival material which include historical documents from the Whakatāne district and the Bay of Plenty region. The Museum is open for research, Wednesday and Thursday afternoons, from 1.00pm – 4.00pm and Friday mornings from 9.00am to 12.00pm. During these hours staff are on hand to assist with questions and a research/reference collection is available and includes historical newspaper scrapbooks, a photographic gallery, biographical files, Historical Society publications and the Whakatāne Beacon newspapers. More in-depth request and collection access require an appointment to allow staff to prepare items, ensuring that your research time is spent effectively. Researchers can also make initial enquiries by email (museum@whakatane.govt.nz ); or telephone 07 306 0505 between 8.00am and 4.30pm Monday to Friday.